Caster Semenya also stormed through to stun her competitors in the 400m final in Brussels. While Caster Semenya stormed through to stun some of the world’s top 400m sprinters, long jumper Luvo Manyonga stole the show with an impressive victory of his own at the season-ending Diamond League final in Brussels on Friday night. The Olympic silver medallist sailed over 8.20m with three of his first four attempts before launching a massive 8.48m leap in the fifth round to secure a convincing win. 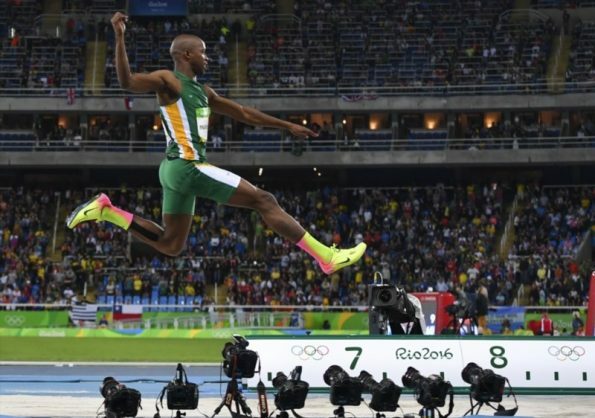 The 25-year-old athlete added 11 centimetres to his personal best, falling narrowly short of Khotso Mokoena’s seven-year-old national record (8.50m). Semenya, meanwhile, used her strength as a middle-distance specialist to close down the field in the home straight, charging through to win in 50.40. She crossed the line 0.10 clear of American athlete Courtney Okolo, chopping 0.34 off her career best and climbing to third place in the all-time SA rankings over the single-lap distance behind Heide Seyerling (50.05) and Myrtle Bothma (50.12). Having concentrated on the 800m event at the Rio Olympics last month, where she won gold, Semenya offered another indication of her potential over 400m, should she opt to compete over both distances at next year’s World Championships in London. Elsewhere at the Brussels meeting, the last track and field competition of the international season, Carina Horn struggled to find a rhythm after a sluggish start but held on in the second half of the women’s 100m sprint, grabbing fifth spot in 11.14. Olympic semifinalist Wenda Nel finished sixth in the women’s 400m hurdles race in 55.41, more than a full second outside her personal best, looking fatigued at the back end of a long season. With their solo victories, Semenya (who won the 800m campaign in Zurich last week) and Manyonga both finished third in the Diamond League series standings in their disciplines, while Horn and Nel ended fourth overall in their respective events.